What is the difference between oil-resistant and slip-resistant shoes? I bet you have heard of non-slip shoes or slip-resistant shoes. They are basically shoes with specially-designed soles to add more friction between the soles and the underneath surface. Here’s a typical outsole of a classic Oxford lace-up shoe. And here are some specially-designed outsoles of slip-resistant shoes. You can see some patterns on the non-slip outsoles when compared to the smooth normal outsole. They don’t make them for beauty. The patterns on the soles, and their materials (typically rubber and foam), greatly increase friction between the sole with the ground. Thus, non-slip shoes help wearers stand more firmly on a surface (especially slippery ones). This just works exactly like any vehicle tires do. So, now you know about slip-resistant shoes. Have you heard about oil-resistant shoes? Are those two the same? Are slip-resistant shoes also oil-resistant? The answer is NO. They are DIFFERENT! Keep reading if you want to know why. These terms, in fact, mean the ability of different parts of a shoe. “Slip-resistant shoes” means the outsole (and insole, sometimes) is designed to reduce the chances of slip. 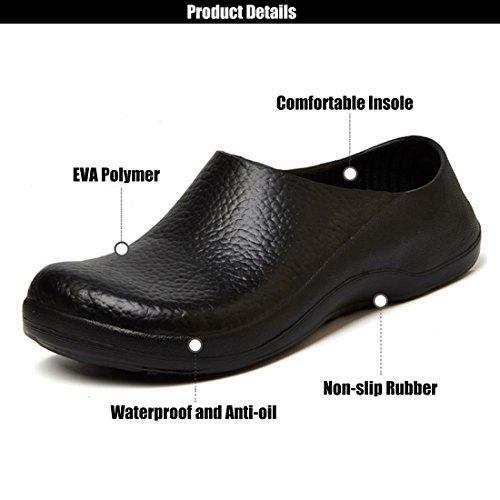 “Oil-resistant shoes” means the whole shoe, including its sole, upper, counter, lining or any other things on that shoe, is designed to be not damaged by oil. And thus, they will last longer if exposed to oil. You should understand that “resistant” does not mean 100% proof. Slip-resistant means much less slip and oil-resistant means much less damaged by oil. Now we are talking a bit of science here. Oil, or some other petroleum-like substances such as petrol, is corrosive. They will decompose shoes’ materials gradually. Rubber, fabric and leather (the most commonplace materials for shoes making) can all be eaten away if they are exposed to oil frequently. The more and longer exposure is, the faster corrosion progresses. Oil-resistant materials, such as oil-resistant rubber, have a much higher resistance against oil. The corrosion still happens but slower. So, people create oil-resistant shoes in order to keep them alive in oily environments. You may not want your shoes to become rotten after a couple of months. Furthermore, they ensure safety for any workers who are frequently exposed to oil. The workers absolutely don’t want to slip during the work or, more serious, they don’t want to be damaged by some types of harmful oil. Can’t they be the same? Again, slip-resistant and oil-resistant are different. But, a shoe can be both slip- and oil-resistant. But they are still different terms, be aware! You can easily find this kind of shoes’ descriptions on many Non-Slip Shoes Shop or Non-Slip Shoes Brand Sites. This means they are offer shoes that have the outsole resistant to slip and oil. The shoes themselves are NOT guaranteed to be oil-resistant (not mentioned in the details). So, if you work on any oily surfaces (there is oil on the surface and it is slippery), you can use these. But if there is oil splashing onto your shoes at your workplace, these shoes might degrade quickly because they are not oil-resistant. Only the sole is oil-resistant. That’s when you might need to look for some oil-resistant shoes. Very often, oil-resistant shoes are also slip-resistant. Manufacturers usually test slip-resistant shoes before selling them. Because a customer slips while wearing slip-resistant shoes is the last thing they might want to happen. They test them on slippery surfaces. And, in fact, oil and water are mostly chosen to create slip surfaces due to their availability and wide use. 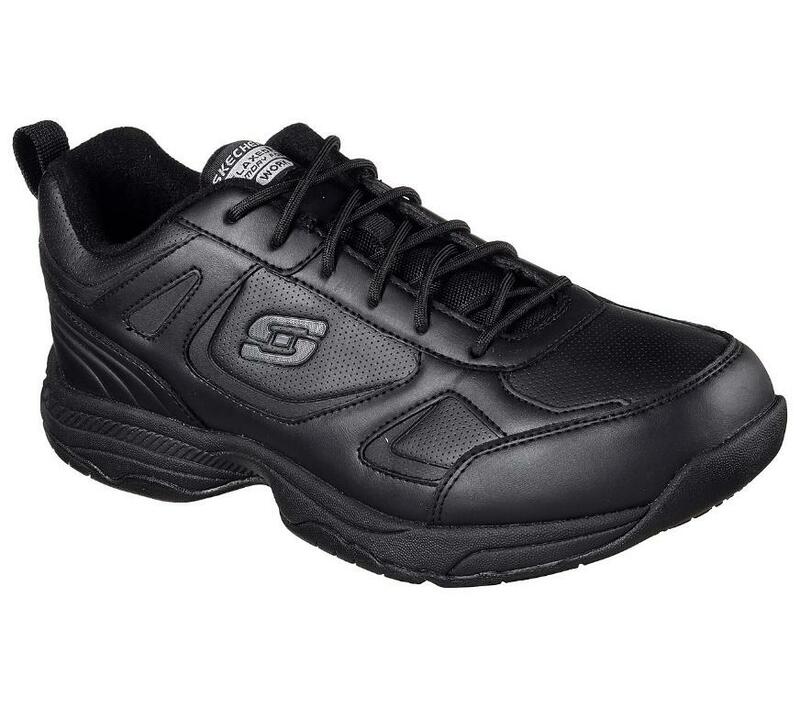 So, you can see that the majority of slip-resistant shoes come with oil-resistant outsoles. They are what you want. Buy them. If you are working in an oily environment and your whole body is exposed to oil, you may need to look for slip- and oil-resistant shoes. I am referring that the whole shoes are oil-resistant, not just their soles. Pro tip: Check with the seller cautiously if the shoes are oil-resistant or just their soles are.